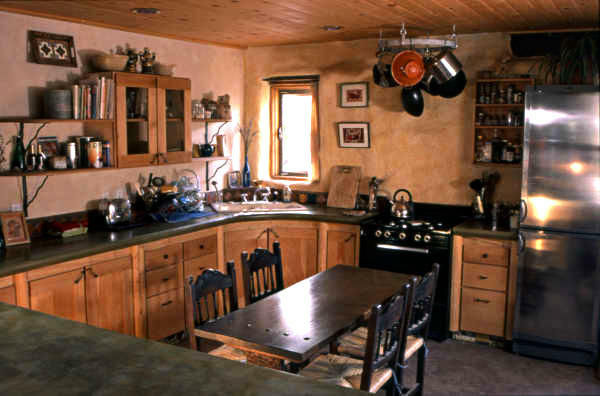 This tastefully designed home was built on a shoestring budget by owner/builder Alison Kennedy in Moab, Utah. 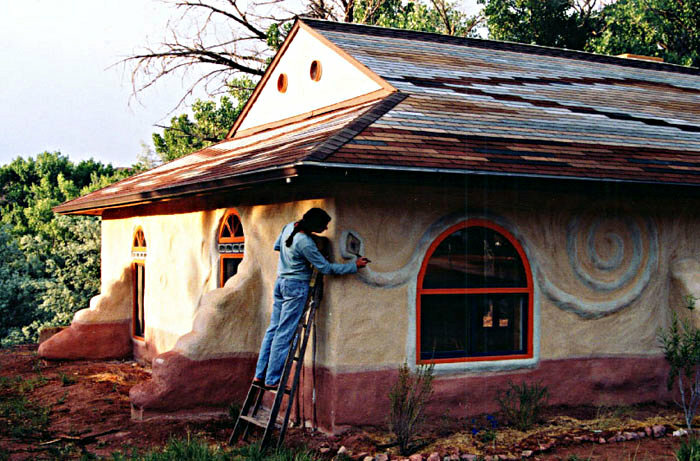 The 1,000 square foot earthbag home is the first permitted earthbag house in Utah. Alison Kennedy applied for and received a building permit from the Grand County Building Department to build a post and beam structure with earthbag in-fill. The foundation/stemwall was constructed of poured concrete and conventional concrete block. She used typical woven polypropylene 50 pound bags filled with "reject sand" delivered from a local gravel yard. Alison in-filled earthbags between concrete and wood posts. 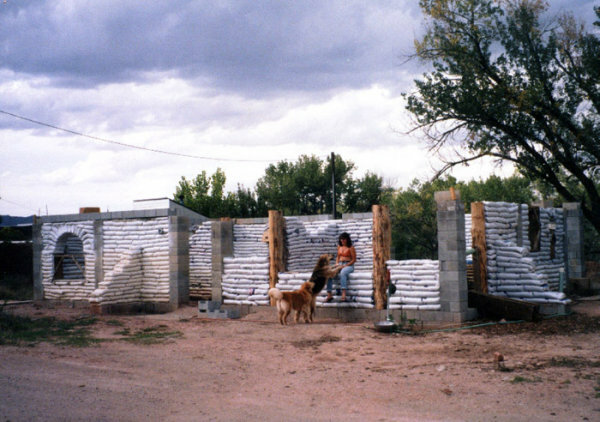 A concrete block bond beam was mortared into place on top of the wall to tie all the walls together and provide an anchor for the wood truss roof members. Alison takes a break with her pals Moki and Ruby. After completion of the bond beam, wood trusses were installed. The exterior of the bags have been covered with an earthen plaster to protect the woven polypropylene fabric from UV degradation. 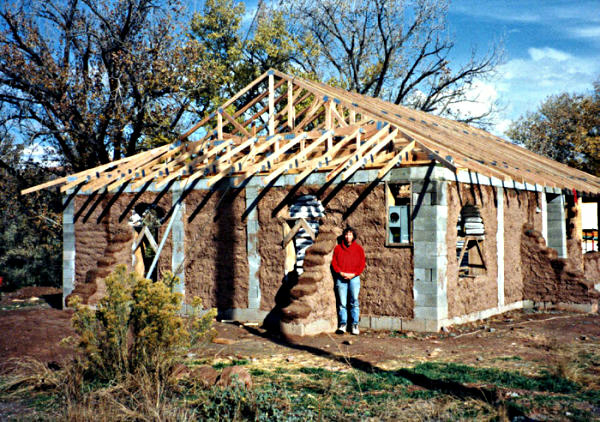 The truss roof was sheathed with OSB and tarpaper and then covered with assorted colorful asphalt shingles acquired from left over end lots and laid in a design pattern inspired from traditional Navajo weavers. 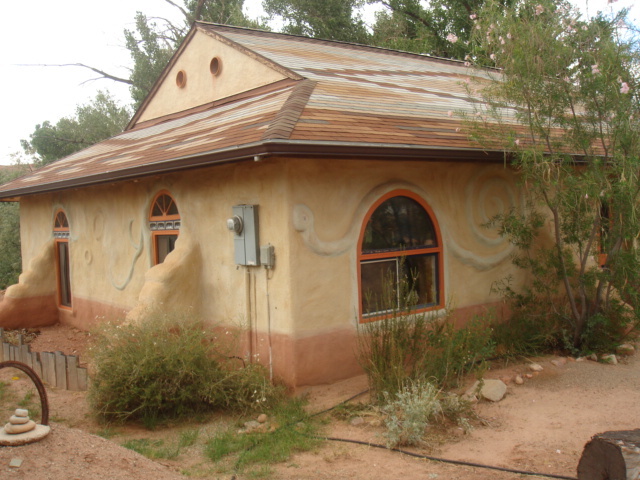 The exterior walls were covered with a primer coat of earthen plaster followed by two coats of lime plaster for additional erosion protection. 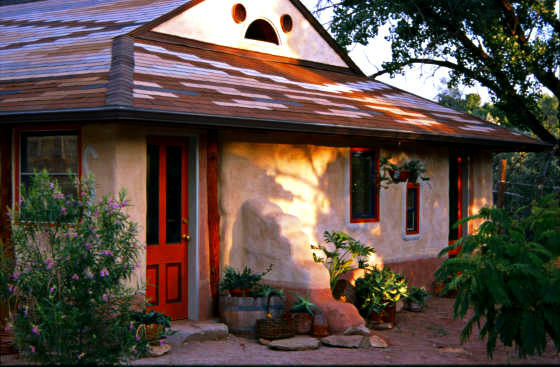 Alison harvested wild colorful clays, which she made into a paint and applied to the surface of the fresh lime plaster. This is a technique called fresco that permanently bonds with the lime during the curing process. The warm colors of Alison's house are created from painting earthen pigments onto the surface of the lime plaster while it is still moist. This is an ancient technique she learned from Michelangelo. Nice, huh? Alison 'wove' an intricate pattern of multi-colored shingles on her roof that resemble a Navajo blanket. 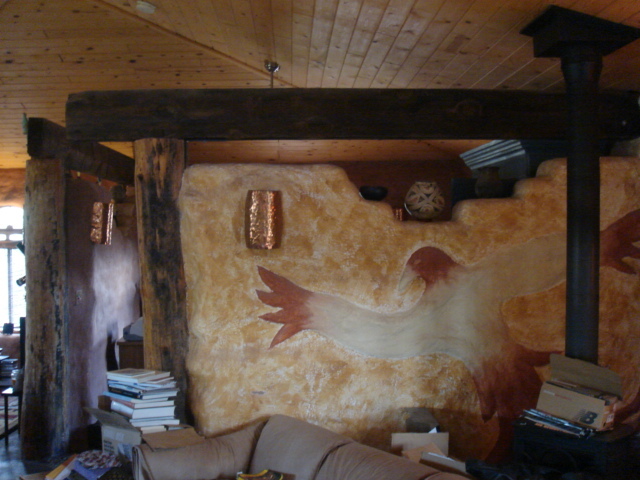 She sculpted designs onto the walls with earthen plaster followed by a lime plaster. 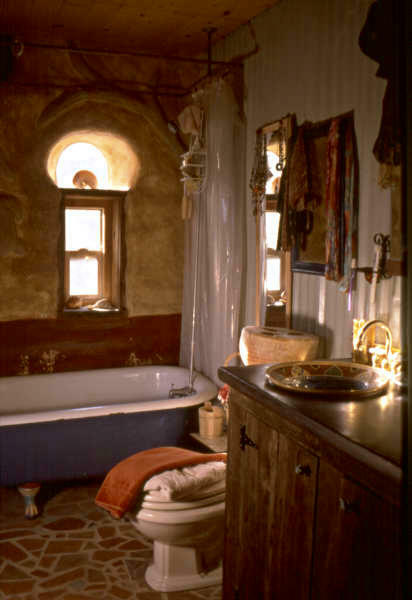 The interior features all earthen plasters and natural clay paints. The floors are poured adobe over a radiant heat floor system. Inset tile details are installed throughout the house. What does the inside of an earthbag house look like? Any way you want it to! Alison's kitchen boasts a splendid wrap-around poured concrete counter and custom-built cabinetry. The floors are poured adobe over a radiant floor heating system. Even a bathroom can become a work of art by using simple materials in unusual ways. Alison's house is warm, friendly and solid! Thank you, Alison, for helping to introduce Earthbag and other natural building techniques to our community in such a simple and attractive fashion!